Ask Amanda: Are my stitches twisted? Before I delve in, it may help to clarify the difference between intentional twist stitches and unintentionally twisting your stitches. It can be a little confusing with such similar names, but they are two separate techniques. Twist stitches (the intentional kind) are a nice way to add surface texture to your knitting. 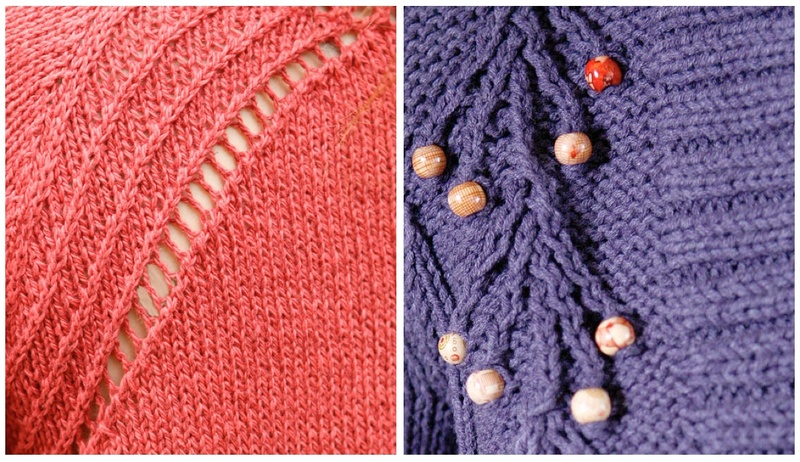 The examples below show twist stitches in action (Tolland on the left, Ria on the right). There’s also a handy how-to video on our website if you’re interested in learning the basic twist stitches. When it comes to unintentional twisting, an accidentally twisted stitch is created if the stitch is knitted through the back loop, which is one of those funny knitting techniques that can be either the result of an accident or done on purpose (it’s abbreviated in our patterns as ktbl). In each of the examples, I highlighted one stitch so you can compare a standard stitch and its twisted counterpart. In the standard stitch, you can see that the left leg (colored in red) and the right leg (in green) of the loop are sitting side-by-side. When it’s knit through the back loop, the right leg gets pulled across the stitch to the left side, overlapping the left leg to create a twist. 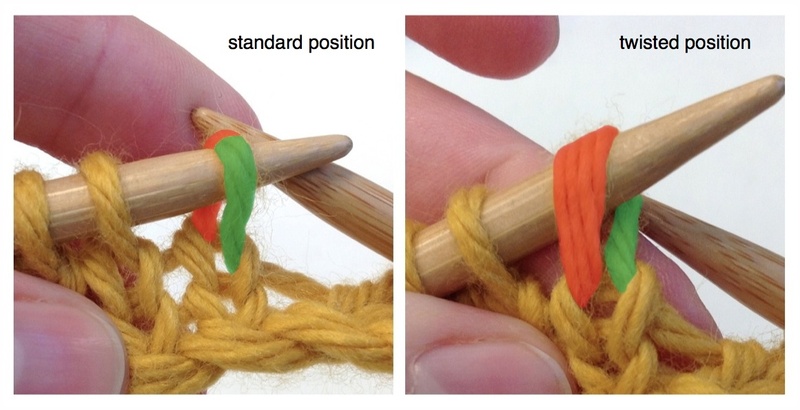 If you think you might be knitting through the back loop but aren’t sure, insert your needle into the next stitch as if you were getting ready to knit, then compare it with the photos below. The leg of the stitch that’s closest to you should run behind your right needle. If that leg of the stitch remains in front of the right needle, you’re inserting it through the back loop. Let’s look at one more way you could accidentally twist a stitch. If your stitches slipped off the needle and you’re trying to slip them back on, it’s important to pay attention to the way they’re being returned to the needle. Take a look at the photos below for guidance. You’ll want the right leg of the stitch (again colored in green) to be closest to you, with the left leg (in red) facing away from you. Learning to recognize the difference between standard and twisted stitches can be a little tricky, but once you get the hang of it, all your future twists will only be the intentional kind! Thanks Dorothy! Glad it helps. Thank you for this little lesson, it’s very timely. I wonder if intentional twisted stitches do anything else besides adding texture to the knitting. In the case of a 1×1 twisted rib, does the twist cause the rib to be a little tighter? Also, does twisted stitches use more yarn then regular stitches? Thank you again! You’re right on the money – intentionally twisted stitches have less stretch, making the fabric tighter. Anything fancier than stockinette tends to use a little more yarn, so the twisted stitches would fall into that category too. And one of my favorite stitches is the 1×1 twisted ribbing – it is a little bit tighter than a standard 1×1 rib and very pretty! Thank you very much. Nice to have the illustration & clear explanation. wonderful! so clear and explains a lot about what I done unintentionally in my own knitting. Wonderful information. Thank you so much. I grew up knitting through the back loop, but then wrapping my purl stitches clockwise, instead of counterclockwise. I always figured that untwisted the stitch. I bet not, as my stockinette resembles your sample on the right, mor ethan the flatter one on the left. This is interesting. These days I alternate by project whether I knit front or back loop, to change up my wrist action. I ought to pay attention and compare swatches. Thanks! Hi Gale! This is very interesting – you’ll have to keep us posted on what you find out! I knit through the back loop as it’s much easier on my hand movements and I’m a much faster knitter, both with knitting and purling (see http://www.modeknit.com). I became a Combined Continental knitter accidentally, when the first sweater pattern I did had me do Twisted Rib and had the typo (ktbl, ptbl…the to tbl’s just cancel out to make regular rib). I didn’t know any better, so just worked as the pattern said. I soon realised I knit a LOT faster and my wrists hurt less with this technique, so I just started using it for all my knitting! I’ve found it actually makes no difference if you put the needle through the front or back, but that the difference lies in whether the yarn rotating around the right hand needle is rotated towards or away from the left hand needle; in my method, the right wrist motion is always “sweeping” the yarn towards the left needle and up to form the stitch, thus making it very efficient and even. When I first started purling (through the front loop), I didn’t realise it mattered which way the yarn was rotated around the right needle; needless to say, things looked a bit wonky! So now I am careful to pay attention to that component when learning new stitches, etc. Based on experience, the most obvious way to knowing you’re unintentionally twisting stitches is whether the loops on the left hand needle all “face” the same way. It took me a few months to realise this! Thanks for sharing your experience, Crystal. And your story illustrates the value of trial and error, where something accidental can lead to an important discovery! When knitting stockinette on circular needles, I always knit through the front, but when knitting stockinette on strait needles, I find I have to knit through the back on the knit side, and purl on the purl side to get stitches that don’t look twisted. Is this normal, or do you always knit through the front, even on strait needles? I just realized I was doing this today. I usually don’t knit on straight needles. So after making a mistake and having to unravel some I got confused. I realized my stitches were facing the wrong way. Then I kept trying to fix them and it wouldn’t stop. I thought I was having some kind of episode and forgot how to knit. No matter what I did, every new row they were going the wrong way. I’m glad it’s not just me. I learned something today (although I usually don’t twist my stitches)! That’s great – thanks Jean! 🙂 thank you! I am teaching myself to knit. One look at your pictures n I knew I was twisting all my stiches unintentionally. But it wasnt knitting through the back loop that as causing it. I was purling wrong. Instead of taking the working yarn and feeding it in clockwise I was doing just the opposite. It caused every other row to be twisted. Thank you so much! If I hadn’t seen your pictures who knows how long I’d been stuck doing it wrong! I’m so glad the photos helped! Now you can knit (and purl) with confidence! I’m now a seasoned knitter with years of knitting under my belt, but when I started out my stockinette was twisted. I learned this from the failure to make a proper YO eyelet when I attempted lace. The culprit was not, however knitting through the back loops. I was wrapping my purl stitches wrong. I’ve since had a friend who did the exact same thing. So, it’s possible that someone is knitting the right way and twisting their stitches by wrapping their purls wrong! This was so helpful. I am making this mistake on the “wrong” rows.. will you please help me? Do you mean you’re twisting stitches when you’re purling? We have a couple of videos on how to purl. Let me know if those help or if you have more questions! Thank you for this graphic set! I have heard a lot about “careful not to twist your stitch!” but no explanation about what that looked like. I learned how to knit through written instructions (no videos, photos, or people to help). Even when knitting the piece, I thought it had something to do with all the yarn on the same side of the circular needles and making sure the yarn didn’t wrap around the circulars once when staring a seamless circular join. Anyway, I was watching videos on continental purling. I realized everyone was purling a strange way (I wrap clockwise). I found a video that showed the clockwise wrap method and everyone was complaining about twisted stitches. Which lead me to your page and your very helpful photos. I do twist my purl stitch, but I also (automatically) always knit to the arm of the loop that’s furthest to the right (whether it be in the front or back)–which coincidentally untwists the stitch.